You wake up on a cold, bleak morning and you feel…well, there’s no way around it, kind of miserable. Not deathly ill. Maybe you have a mild fever, maybe you don’t. You just know you aren’t going to be your best at work today. Well, as medical professionals it’s easy to say it’s ideal to stay home and take it easy. If you’re ill, rest and plenty of fluids is the best cure there is for most of these kinds of minor ailments. However, for most of us, life gets in the way. Work obligations often simply can’t be put off, especially for those of us in such fields as entertainment where, very truly, the show must go on. Also, parents with kids often have a responsibility to make sure their offsprings’ needs are being taken care of. So, what can be done? The first answer is, if you think you’re contagious with a cold or, even more so, a mild flu, do your best not to spread your germs around. Wash your hands very frequently, avoid close contact and especially shaking hands (the most common way minor bugs are transmitted). A lot of people these days who go to work sick wear medical masks, and that’s not a bad way to be somewhat more considerate of those around you. If you feel comfortable doing that, it’s definitely not a bad thing. On the whole, however, our advice is to simply be mindful of your physical state. If you think you can hack a day at work, that’s fine. 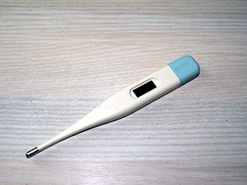 But if you think your fever might be climbing very rapidly, then it might be a good idea to check out of work and even give us call if it persists. There are times when, in the face of a bad flu, a hasty retreat just might be the best strategy.